This is the last part in this 15-part series. Here we’ll focus on how to improve factory productivity in China. Why is it important for buyers? Because, unless your suppliers make progress in this area in the next 5-10 years, many of them will go out of business. Admittedly, if you are not their biggest customer, they will not follow your suggestions of re-organizing production, but it is your responsibility to open their minds about best-in-class practices. I have prepared a simple explanation of how productivity can be increased in a factory, based on a few examples. 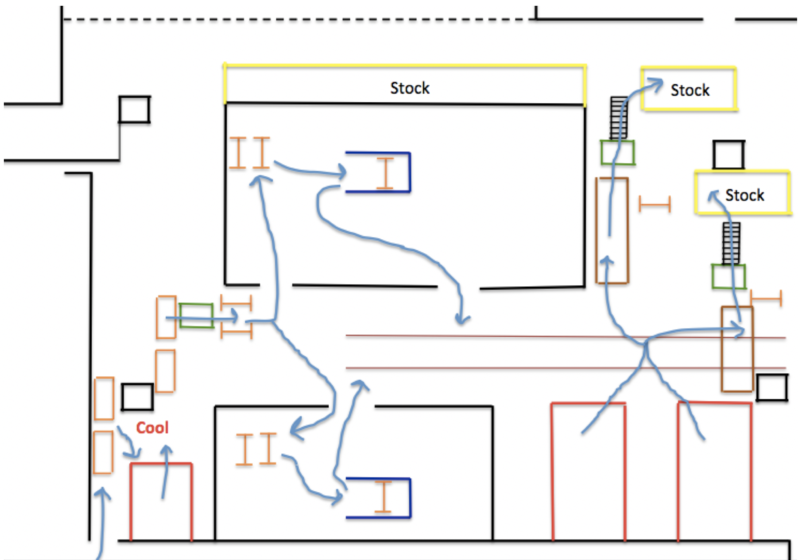 In this example, I worked on improving the flow in a powder coating workshop. 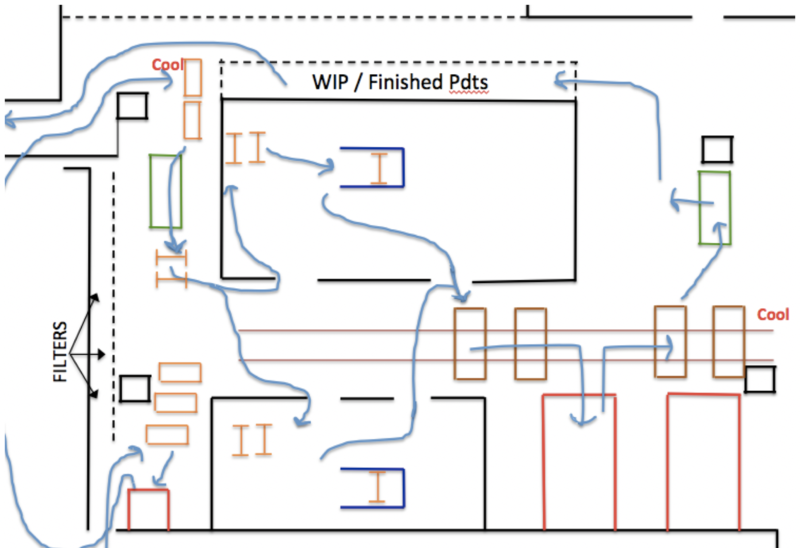 Breaking down walls was not necessary, but it was important to modify the tables, add some storage locations, and organize the flow differently. Since the workshop supervisor had bought into the idea, they moved ahead and implemented my suggestions. 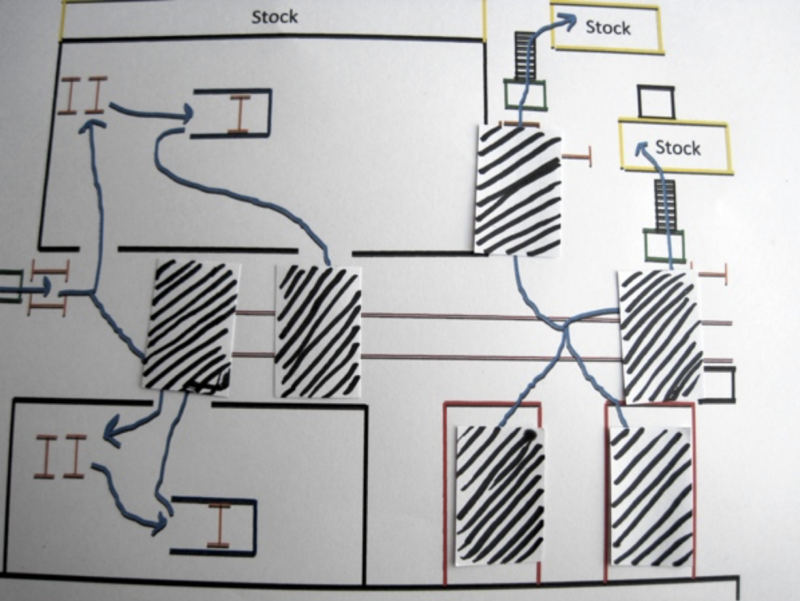 This resulted in eight fewer operators to complete the tasks in this section (they were moved to alternative job functions within the factory where they could be more effective). In this next example, I studied a drilling process. Here again, they were spending a lot of time handling the pieces. Three people were working on the process. 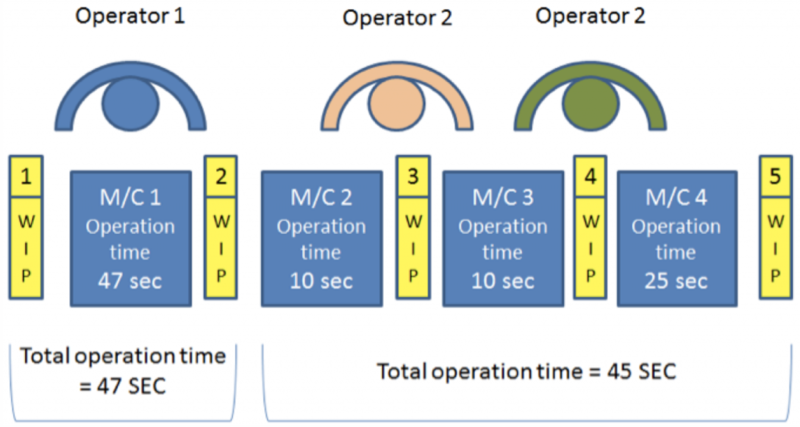 If we look at the process times, operator 1 was taking 47 seconds to complete his task whereas the total process time to complete operations 2, 3, and 4 was 45 seconds; however, it took two operators to complete these tasks. 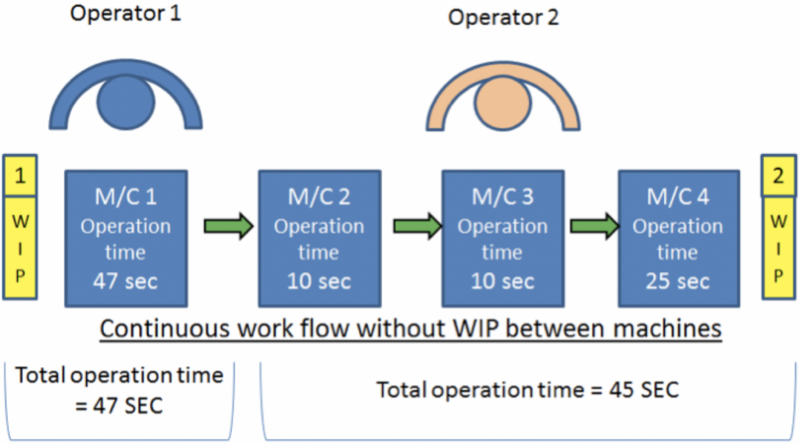 Why was it taking two operators to complete tasks with a process time LESS than the process time of the first operator? It was simply because they were stacking the parts up carefully between each machine (as can be seen in the photo above). Picking up parts and stacking them again takes a LOT of time and effort as well as adding time to the overall process. Is this type of change alone enough? No of course not, there would be many other details that would need to be addressed. The logistics guys love these large boxes, however, they do make up for time-consuming and tiring (if not downright unsafe) manual handling work for operators. A better practice is to have the logistics department “prepare” the components in smaller containers that are made available right at the point of use. 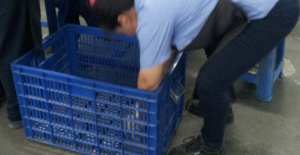 Better yet, use item-specific dunnage to make counting and picking easier. 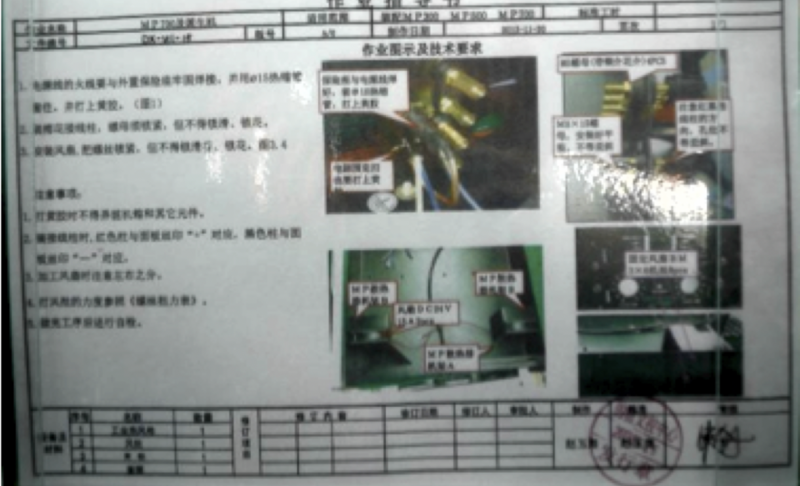 As you walk around some Chinese factories, you have probably seen this type of instruction posted on each workstation. From my experience, most of these instructions are out-of-date but external auditors are too lazy to notice that detail or to read them carefully and to check whether the operators are following them. Whenever an element of the layout changes, it impacts the way operators should perform their job. In turn, these changes should make their way onto the work instruction sheets. Then comes the hard part; strong discipline is necessary to ensure changes are followed, and supervisors should provide coaching and training where and when needed. I chose to focus on simple ways of improving productivity. It is important to score a few easy wins before a Chinese factory owner starts to trust any external party. Well-thought-out automation can help. Make sure to follow the right timeline. New tools/jigs/fixtures can save a lot of time, and at the same time prevent quality issues. Good DFM (Design For Manufacturing), rather than DFCL (“Design For Cheap Labor”), helps immensely. To get back to the introduction of this article, I believe Chinese manufacturers that don’t up their game will be out of business in a few years. Make sure you work with the survivors! Are you trying to find a manufacturer in China who is well-suited to your needs and can also deliver on their promises?